Gift Cards for our massage services available online to purchase here! Space is limited to 5 couples per class, so sign up early! 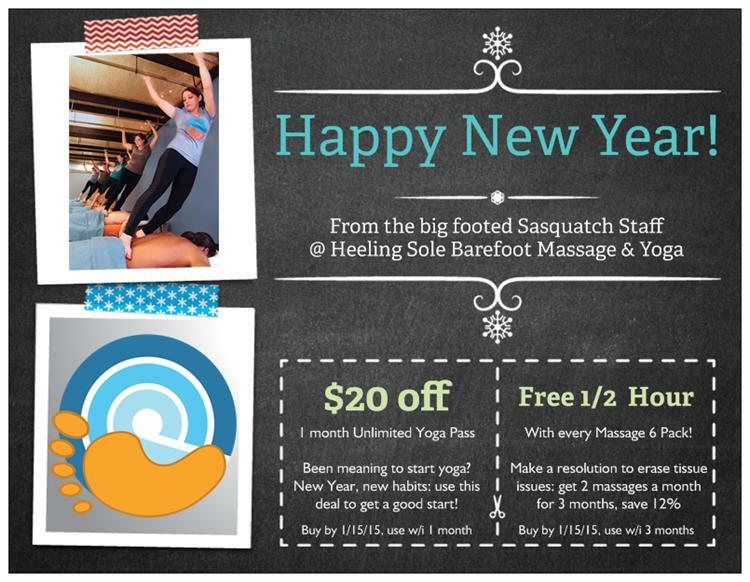 At heeling Sole we are proud of all of our sasquatch staff, whether it is our LMTs Or Our Yogis! This week we are highlighting our Yogi of the month Timothy who teaches Ashtanga. Timothy moved to Texas from Yorkshire in the North of England in 1980. He has completed 18 marathons and 7 ultra-marathons. Timothy enjoys classical music, cooking, cryptic crossword puzzles, and tatting. We sat down with him and did a little Q&A so you could get to know him better. How long have you been teaching Yoga? I have been a practitioner of Yoga for many years, but started teaching about 6 Months ago. Is yoga part of your daily routine? If so, how? The last 6 months I have made it a goal to practice Ashatnga daily. I also have a 30 minute morning routine I have been doing daily the last 18 months. What tips would you give newbies? Listen to your body. It’s all about the breath. Enjoy the journey, don’t worry as much on the destination. Every day is different. What is your favorite yoga resource or website? I don’t have one favorite, but Jeni has a great handbook for Beginners that helps when taking my class. What is one thing today you are grateful for? I would say it is discovering, although later in life, the physical, mental, and spiritual benefits of daily yoga practice. Come try Ashtanga: Sundays at 1pm, and Tuesday/Thursdays at 5:30! I’ve lovingly nicknamed our yoga and massage therapy staff members as “Sasquatches”, and it’s about time you meet everyone and their feet! This weeks Sasquatch is Timothy! Timothy is our latest addition to the team. He teaches our Ashtanga classes at 5:30 on Tuesday & Thursdays, and co-teaches Ashtanga on Sundays at 1pm. Timothy moved to Texas from Yorkshire in the North of England in 1980. He has been practicing yoga for over 16 years. He is a certified tennis teaching professional working at clubs mostly in the Houston area, but also in Dallas, and San Antonio. He has completed 18 marathons and 7 ultra-marathons. Timothy enjoys classical music, cooking, cryptic crossword puzzles, and tatting. He is RYT-200 yoga teacher certified, and maintains a personal daily ashtanga practice. He has an earth-loving personality and exudes a quiet, calm energy. These traits will help you relax, find your center, and gain peace and tranquility in your hectic life. Come try it out, Sundays at 1pm, and Tuesday/Thursdays at 5:30! Our first year (plus four months extra) anniversary offering Yoga at Heeling Sole came and went with the Spring Equinox back in March.… time really flew by, not only for that year, but just in the last quarter! We’ve seen some great growth with our yoga program, experimented with some fun ideas, (anyone remember the Root-Beer bottle “Om” on National Rootbeer Day?!) we played with class and schedule changes, (all of those fun Walkabout outdoor yoga classes!) we tried a Groupon deal… which sorta paid for our new floor … (who remembers when we were still on concrete!? Yah, I broke my toe and decided the concrete had to GO!) and we were honored by the people of San Antonio to vote us as the 3rd best yoga studio in town: what a year, what a surprise! Thank you so much for dedicating time to yourself to get on your mat with us!! Most of us live with a certain amount of pain and tension in our tissues. Whether we are athletes, computer users, cross fitters, runners, yogis, or just human, residual soft tissue tightness and discomfort can affect our lives in unpleasant ways. With the help of Yoga Tune Up® Therapy Balls, you will explore all of the micro-regions of your body, from the soles of your feet to your head and neck, and of course everything in between! This work is great for anyone looking to support regular bodywork with self-massage and soft tissue conditioning. No yoga experience required and all levels of practitioners welcome! the suggestion of a musician friend, and hasn’t looked back since. What began as a curiosity developed into a passion for health, anatomy, and injury recovery. She completed her 200 hour teacher training in 2011, under the tutelage of David Vendetti and Todd Skoglund at South Boston Yoga, and has studied Yoga Tune Up® with Jill Miller, Trina Altman, and Sarah Court. Additionally, as a classical musician, she has a particular interest in preventing performing artists’ injuries, as well as helping students of all ages live better in their bodies. Healing with SOLE @ Heeling Sole! 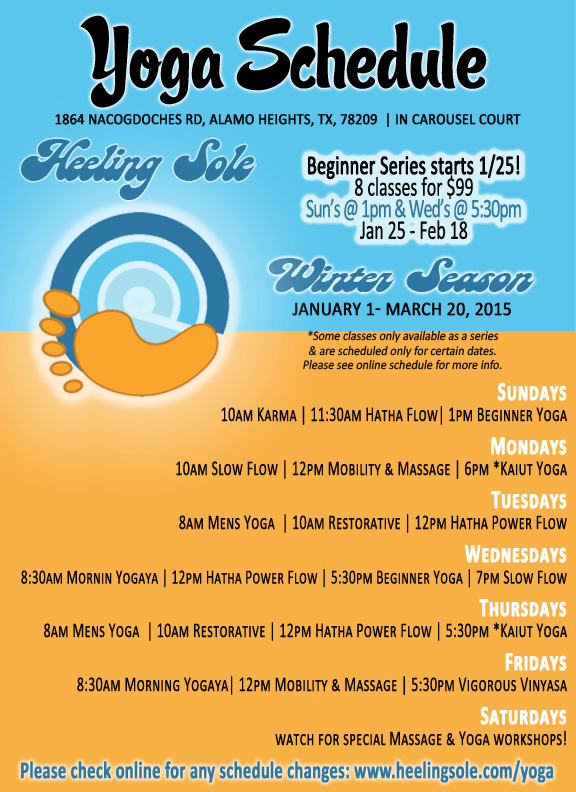 Healing Sole water, great for your Healing Soul at Heeling Sole Barefoot Massage & Yoga! BECAUSE it’s special! One of our yoga instructors, Monica Walker, recently visited Mexico City and brought me back a beautiful raw Aquamarine stone. She picked it for me because in ancient lore, Aquamarines were believed to be the treasure of mermaids, and were used by sailors as a talisman of good luck, fearlessness and protection. It is the stone of the sea, and that’s the thing that I love most. It was also considered a stone of eternal youth and happiness, which is something I am thinking about more and more the closer I get to turning 34 tomorrow! Well, combine that amazing stone with this new fun water dispenser, and we’ve got Step 1 of our Healing Sole water. The Aquamarine is soaking in the jug, and it’s strong metaphysical properties that are slowly absorbing out into the water will help you to let go of old emotional issues you may be holding on to. (I know I’ve got that to work on!) By assisting us all to release anger and reduce stress, these lovely stones help to heighten your courage when you are handling grief, and are powerful to assist self healing. Out mermaid infused water may help you to make positive changes in your life, as we are creating a positive structural change in your chronic soft tissue issues with each Ashiatsu Barefoot Massage session. Step 2: Add the SOLE. Monica had an idea. We dissolved diamond-like all natural Himalayan Crystal Salt into the jug, which contain trace minerals essential for life. Dissolved Himalayan Crystals in water make “Sole”, a highly effective energy balancing elixir for the normalization of minerals in the human body. (Look up a Sole recipe for you at home here.) WHO KNEW! I was so amazed to find out that there is actually a healthy water drink that is actually called SOLE, (I didn’t make this up, and NO, it’s not soaked in our feet!) This elixir is so perfect for us here! This dissolved salt has been shown in a clinical study to be effective in helping to stabilize pH and Oxidative Stress numbers – just what the doctor ordered this holiday season. Himalayan salt is widely touted for its mineral content, containing 84 minerals in total. In addition to sodium, Himalayan salt is relatively high in iron, magnesium, phosphorus, calcium, potassium and chloride. It also contains traces of boron, fluoride, iodine, zinc, selenium and copper, all of which are necessary for bodily health. SO, I have written notes of love and thanks on the jug for our water to read, absorb, and energize itself with positive vibes while it awaits your next yearning for a cool gulp of refreshing, healing water. So drink up some liquid good juju next time you come to our office in Alamo Heights! It’s great to enjoy after your next Yoga Class here in Carousel Court, as well as before and after each deeper than deep tissue Ashiatsu massage. Connects your 1st, 4th and 5th Chakras, the Root, Heart, and Throat with the healing colors of red, blue and green. Gift Cards available…. Training for Massage Therapists offered monthly.